Elkay® Remote Water Chillers Can Be Used With Any Drinking Fountain. Elkay® remote water chillers convert any drinking fountain into a water cooler. Designed for indoor use. Made using rust-resistant galvanized steel. Features a hermetically sealed compressor. Can be connected to bubbler, glass filler or cold water dispenser (sold separately). May install directly to water unit or in a service area to serve up to three remote outlets within a 15 foot radius. 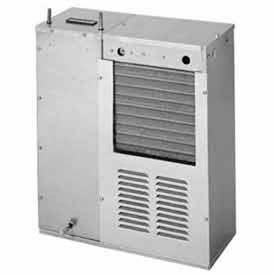 Provides 50°F drinking water, based upon 80°F inlet water and 90°F ambient temperature. 1 Year Limited Warranty. Halsey Taylor® Remote Chillers Are Used For Providing A Chilled Water Supply To Convert Drinking Fountains Into Water Coolers. 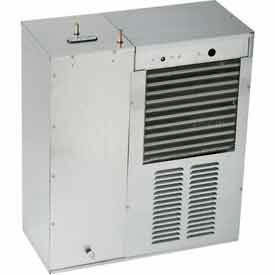 Halsey Taylor® Remote Chillers are made of rust-resistant heavy gauge galvanized steel for long lasting durability and dependability. Include removable service panel for easy maintenance. Fan motor is a self-lubricating bearing type for maintenance-free longer life. Hermetically sealed, positive start compressor has lifetime lubrication and built-in overload protection, efficient capillary sizing and large capacity dryer-strainer. Self-lubricated fan cools copper/aluminum condenser. 5 Year Limited Warranty. Available in 320 to 1290 watt models.